A little under a year ago, when I was still working for a foundation in Prague, I went to a soiree at the residence of Argentine Ambassador Juan Eduardo Flemming. When Flemming, an international connoisseur of the arts, introduced his musical guest, Jana Lewitova, who specializes in medieval music, as "the most brilliant voice of the Czech Republic," I pricked up my ears. Well, not only did this fortyish blonde mezzo-soprano with a shy smile sing for almost an hour with crystal clarity and sound colors I'd never heard before, but she also transformed my life. During the buffet supper that followed her performance of Sephardic Jewish songs, I overcame my own shyness and asked Lewitova for some personal help. I wanted to cultivate my public-speaking voice. I told her I had no singing ambitions - just a desire to know myself better by exploring the possibilities of my voice. To my surprise, she invited me to come out and see her some Saturday in Dobrichovice, 20 minutes from the Praha-Smichov railway station on the Beroun-bound local. Awed by my own presumption, I waited three months before taking that train. In the interim, I discovered, to my embarrassment, that Lewitova is even more famous as a voice teacher than as a singer. Every August, she and her frequent singing partner, Vladimir Merta, give a renowned weeklong singing course in Slavonice, south Moravia. So who was I to barge into her home for help with my speaking voice? It was a little like asking a writer to fix my typewriter. She was pruning a magnolia tree when I arrived in Dobrichovice. Without any formalities, she led me to a little room, modestly furnished with a desk, a bed, a few chairs, a piano and a view of tree-lined hills. Closing the door to the outside world, she hit some notes on the piano and asked me to vocalize. I hesitated. After all, I wasn't here to take singing lessons. "Singing is the cultivated expression of emotion," she explained in accented English that belies her Welsh mother's tongue. "Your tool of life -- breathing -- becomes voice when you use it." From then on, it was total immersion. A whole universe unfolded as I realized how energy, emotion and breathing work together to produce a sound that belongs only to me. Of course, I didn't feel that confident at the outset. But Jana insisted: "Singing is just another form of speaking. You have to feel that you're telling something of importance and your voice will reflect it." According to Jana, singing comes so naturally to the human species that there is something missing if we don't sing. But, she added, in our modern times "people forget to sing." Therefore, reconnecting with our inermost emotions and releasing them through breathing and singing is "a modest way to heal industrial styles of living." Almost every Saturday afternoon from then until autumn, I rode that rickety train from Prague to Dobrichovice. When I intonated in that tiny room, birds flying by would stop at the window to listen and the dogs downstairs would bark in response. I was relieved to learn from Jana how welcome I was. "I wouldn't like to teach an ambitious opera singer," she told me. Instead, she prefers to help her pupils find their own individual means of expression. "Every person can sing" is her conviction. The age of her students ranges from 10 to 60: "It is never too late. An elderly lady from our village is taking singing lessons with me and has made significant progress that I never expected." Jana takes much pride in a blind girl she taught for years in Dobrichovice's public school: "She used to call me her 'therapist.' Now she's so good that she'll enter the Music Academy in Prague." One of the key lessons I learned from Jana is that the voice of a person should carry the energy of the whole personality. Early on, she made me aware that I tended to speak from the head only, not exploiting the full potential of using the whole body's energy to speak. "In the business world, people tend to communicate your way," she consoled me. "Very few people join the energy of their emotions with the voice. This is taboo in our society. The expression of personal emotions meets with little acceptance. It is why people disconnect with part of who they are and don't use their voice fully." Jana Lewitova was born in postwar Prague: the fourth child and third daughter of an unusual couple who'd met in wartime England. Her Czech Jewish father, later an internationally renowned physicist, was a flier with the Czechoslovak forces fighting abroad when he fell in love with a Welsh student of translation and linguistics who was soon able to converse, accent-free, in his language. When Jana was 10, her brother Tibor, 14, was hit by a car. He lived for a few years, but with serious physical and mental damage. To make the rest of his life more bearable, the family moved to the country. Singing in the CKD factory's children's choir in Prague for five years, Jana discovered Renaissance music there and later graduated to a prestigious ensemble, Prazsti Madrigaliste (Prague Madrigalists). Then she enrolled at the Prague Academy of Musical Arts (HAMU) to study with Professor Karel Berman, the late, great National Theater artist. Berman, a historic survivor of the rich Jewish musical life the Nazis never quite extinguished at the Terezin (Theresienstadt) concentration camp, had "an overwhelming mix of melancholy and inner strength about him," Jana recalls. He felt a special connection to her half-Jewishness so they conversed in music and he taught her to "tell by singing." Then he sent her to Terezie Blumova, a Hungarian Jewish singer who, in her 90s in Prague, still teaches rhetoric and music. Blumova raises consciousness of breath, tension and body position: a method Jana used on me. After 1989's Velvet Revolution made travel possible, Jana attended Jessica Cash's summer course in Innsbruck, Austria: "It was marvelous! A whole group of professional singers crawling on the floor to roar like lions and move like snakes. Jessica's exercises helped me put together different aspects of my personality and find my center." Back at the beginning of the '80s, the architect Daniel Spicka had invited Jana to perform church music -- an art form unappreciated by the communist regime -- in underground concerts of his RSX ensemble. There she formed an artistic partnership with Rudolf Merinsky that resulted in a breakthrough CD. 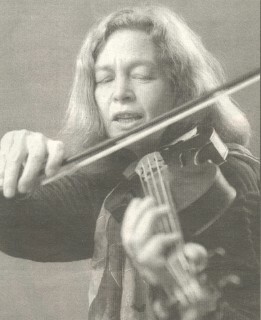 She also resumed playing viola and violin, instruments she'd left behind for singing. In 1995, Jana hooked up with Merta, who was helping the Mispacha ensemble revive Hasidic music (from an Orthodox Jewish sect founded in Poland in the 18th century). She introduced Merta to Sephardic music (of Spanish and Portuguese Jews), which they now perform especially effectively in rare but well-attended events in the Moorish-style Jubilee Synagogue on Jeruzalemska street, with Jana chanting as she roams the aisles while Merta accompanies on the lute. She is content to sing there and (more often) in Old Town's Spanish Synagogue as well as such countercultural venues as Balbinova poeticka hospudka and, on Nov. 13, a Tibetan tearoom. She says she has achieved every success she'd ever want by surrendering herself to her art. She won't enter song contests "just to accumulate prizes." To her, competition is for sports, not music. It might seem that the interpretation of Czech and Moravian folk rnusic has already been exhaustively studied, but is it true that there is no more to be said? That would mean that Jana Lewitova, mezzosoprano and viola player, would no longer be able to present her creations. I use the word "creation" deliberately: her performances af folk music are far more than interpretations. Although the CD entitled Halé Dité (Sleep, my child), appeared last year, it is never too late to go back to it, and debates around it may go on for many years. This recording rejects the accepted view of (especially) Moravian folk melodies as symbolizing beauty, merriment and melancholy. Jana Lewitova and the others set out to express the rawest, most drastic side of the life they spring from. In these songs life - life in those days when the songs were born, or life today as so clearly mirrored in them - is not easy, it is a space in time between birth and death, a space for love, however wounding, a space in which human history repeats itself. Jana Lewitova has made folk CDs before, singing; the songs of medieval Spanish Jews, and with Vladimir Merta Moravian folk ballads. In this album of lullabies she sings with Agnes Kutas (violin and viola), Hana Flekova (viola da gamba) and Pavel Macak (double bass and percussion). The accompaniment is reduced to the minimum, and Jana Lewitova often sings a capella. This in no way reduces the intensity of the performance. The songs have been chosen from different collections; the well-known song Okolo Hradisca, for instance, will shock those used to the aceepted mild sentiment for the calm waters of the river have "changed course", the young man cheerfully carrying his love in an embroidered kerchief has let it fall and scatter by the way. His bold and happy figure has "disappeared in the darkness". Jana Lewitova gives the word "love" such a sad, longing, chill and yet joyful tone, that she blesses it. One thing is sure: our response need to be one roused by beauty; it only needs to be intense. In many ways this is the deeper experience.